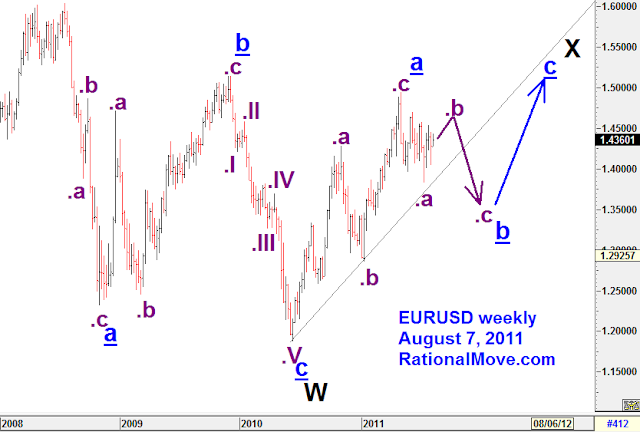 Wave 2 I had been anticipating when I wrote the previous post happened when Swiss Central Bank intervened. The initial rebound to 1.4280 was followed by new low at 1.3970. This meant Wave 2 was either an expanded flat or running flat. 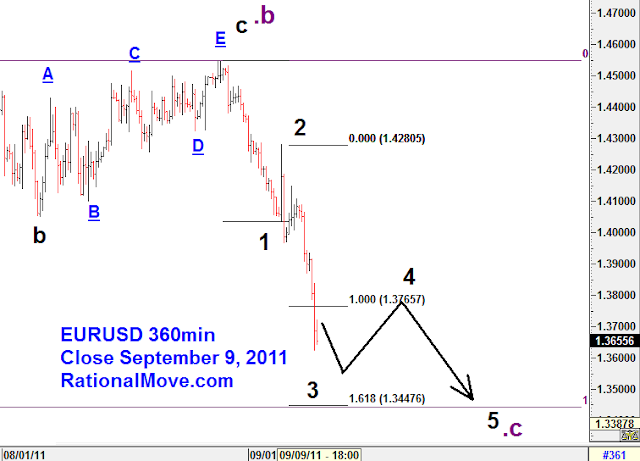 The second upward leg of this correction stopped at 1.4149, so Wave 2 ended as a running flat. This was when I set sell entry order at 1.3959. 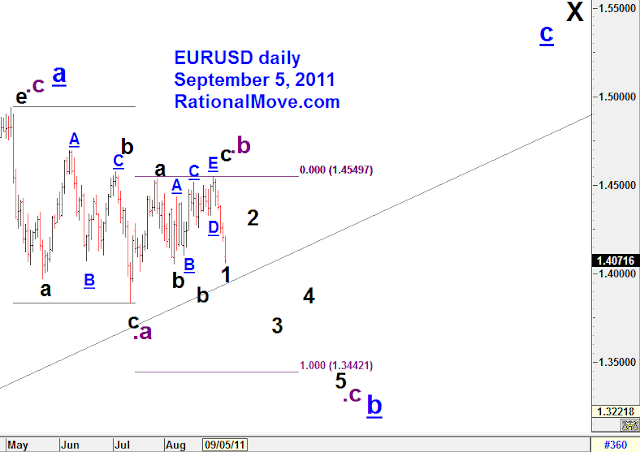 The entry order was executed as ECB announcement suggested the rising of dovish tone of the central bank. Stop loss was set above the high of Wave 2: 1.4291. It was a least stressful operation so far as my position soon started to make potential profit. EURUSD accelerated the descent about 24 hours later as Jürgen Stark’s resignation from ECB’s executive board was reported. The initial resistance level, July 12 low of 1.3837, was easily broken down, and the EURUSD seems to be heading towards the low of February 14, 2011: 1.3428. This is almost coincident to my target: below 1.3450. 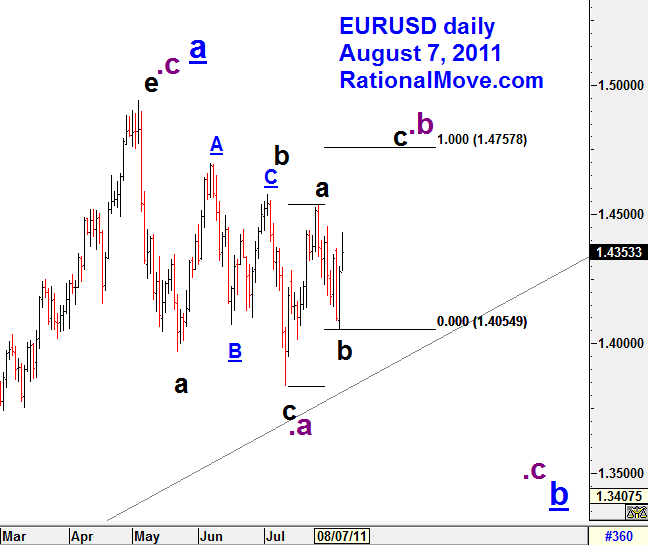 EURUSD rally to .b rather diminished quickly and it did not reach to my target 1.4750. I bought EURUSD and noticed that it was rather forming an ending diagonal (now you can see as A~E), and decided to take the profit very early. Although it was only 0.39% gain in the capital, it was enough to put my performance in the positive side for the year. 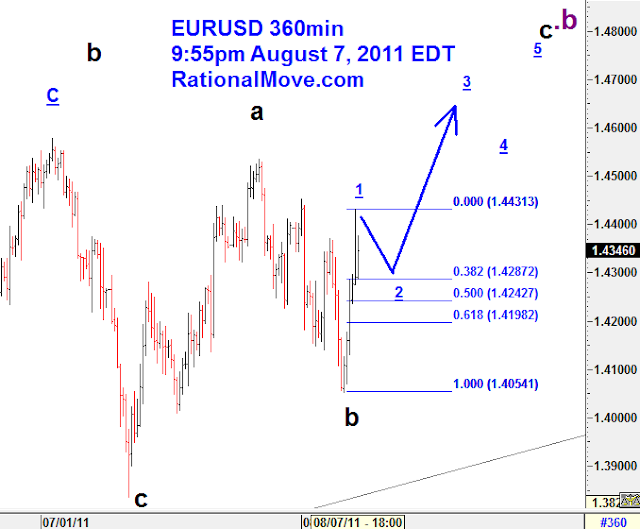 Now it seems EURUSD initiated the downtrend towards .c, b. I will wait for 2, and enter a short position. I had anticipated the target of 1.3450 or lower, but looking at how far Wave 1 went (currently the low 1.4059), I won’t be surprised to see EURUSD to go well beyond this target.